This widely acclaimed film recounts one of the most extraordinary and important stories in American history and explains its contemporary relevance with power and eloquence. In 1492, there were more than ten million Native Americans in North America. By 1910, their numbers had been reduced to fewer than 300,000. In California, massacres of Indians in the 1860s and 1870s had nearly exterminated the Native peoples in the state. Therefore the sudden appearance in northern California in 1911 of Ishi, “the last wild Indian in North America,” stunned the nation. For more than 40 years, Ishi had lived in hiding with a tiny band of survivors. When he walked into the white man’s world, he was the last Yahi Indian alive. For young anthropologist Alfred Kroeber, Ishi’s appearance was a windfall. Kroeber had been searching for years to find “wild, uncontaminated Indians” who could document their traditional way of life. Through Kroeber’s invitation, Ishi left a jail cell and lived out the remaining four years of his life as an informant and teacher at the Museum of Anthropology in San Francisco. Ishi dedicated those years to relating Yahi stories and demonstrating the traditional way of life he knew so well. His quiet dignity and remarkable lack of bitterness toward the people who had destroyed his tribe greatly impressed everyone who met him. 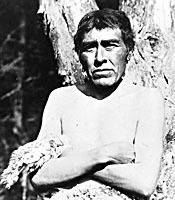 Using Kroeber’s meticulous notes and recordings taken at the time, the film provides a unique look at indigenous life in America before the arrival of Europeans. It features a compelling narration by Oscar-winning actress Linda Hunt and interweaves a lively mix of still photographs, archival film footage, dramatic readings of articles and letters by Ishi’s contemporaries, and Kroeber’s wax recordings of Ishi’s voice. It also includes commentary by historians and anthropologists, an 89-year-old man who met Ishi, and Native Americans who discuss the meanings of Ishi’s songs and myths and the importance of Ishi’s legacy today. Kroeber believed that American Indian cultures were destined to vanish, but Native Americans were to prove him wrong. Today, the Native American population has grown to more than two million, and Native peoples have demonstrated the same ability to adapt and determination to survive that Ishi exemplified. “Ishi” is essential viewing for a wide variety of classes in American history, Native American studies, ethnic studies, and anthropology. In all courses, the film will deepen students’ appreciation of Native American traditions and impart a lasting impression of the troubled history of Indian-white relations. There are logical stopping points every 15 minutes to facilitate its educational use with younger students. “Ishi” was produced and directed by Jed Riffe and Pamela Roberts and written by Anne Makepeace. It is a Rattlesnake Productions Presentation. Major funding for the program was made possible by a grant from the National Endowment for the Humanities. "A wonderful film! It´s absolutely appropriate for elementary students and it´s definitely effective in the classroom. I´ve taught for 33 years and I´ve seen lots of terrible educational films, but this one shows how good an educational film can be." — Kerin Baker, Wade Thomas School, San Anselmo, Calif.